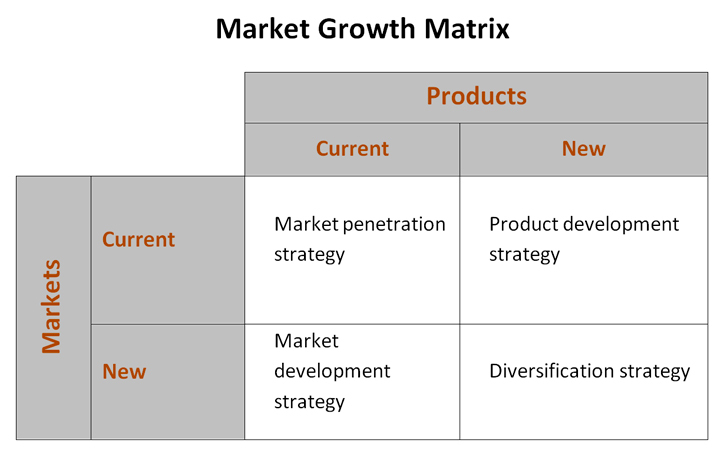 Where does Ansoff’s Matrix and product-market strategy fit in the strategic marketing process? So, we know a data- and information-driven Internal and External Situation Assessment, as partially summarized in some of my previous posts, will provide two main bodies of information: 1) output related to internal business unit strategic strengths and competencies; and 2) a picture of the attractiveness of current (and possibly potential) markets. This then empowers a marketing executive to conduct a portfolio analysis to decide the best market opportunities to pursue. While there are many possible scenarios, let’s pick a particularly rosy one just for illustrative purposes. Let’s say that our portfolio analysis tells us we’re currently in an attractive market, with internal business unit strengths that align and serve the market very well. Furthermore, prospects for growth appear to be good due to the market being in its growth phase of the lifecycle. Rosy, indeed. At this point in the marketing planning process, high-level marketing objectives (likely revenue- or profit-driven) are set, and then strategies to achieve these objectives must be considered. And this is where use of the Ansoff Matrix (below) enters. Given our rosy scenario presented above, it is logical that we’ll likely remain playing in the current market/current product box (i.e. Market Penetration) in order to achieve objectives. This then begs the question as to how we will go about market penetration. We have several strategic options to consider, including but not limited to: sell more per transaction to existing customers, sell more frequently to existing customers, sell to customers currently purchasing from our competitors, etc. But which option is best? Market research and data-driven insights will help us choose among these. Let’s say we choose the latter (selling to prospects) as at least one primary strategy, given that we see an opportunity to increase market share. Now we know that we need to seek those potential customers who currently purchase from competitors but may be “low hanging fruit.” So, market segmentation research and data analysis done with prospective customers may assist. We might examine and identify key descriptors of such an audience that is found to be “likely to switch.” Ultimately, we can proceed in our planning to further understand this consumer segment and most effectively target selected subpopulations or niches with communications, distribution, etc. in our marketing execution. So, to answer the title question above, the Ansoff Matrix comes into play by providing a valuable link between strategic objectives and market segmentation or market studies that ultimately guide marketing execution. One final question as food for thought: Is your current market segmentation clearly linked to your overarching marketing objectives and product-market strategies? Previous PostA take on the interrelation between strategy frameworksNext PostHappy Anniversary, Radiance Blog!